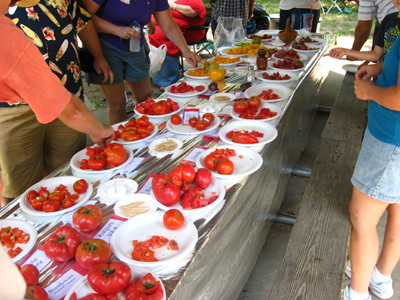 An awesome day at the 2nd Annual Kansas City Tomato Times Tomato Tasting! It was hot, but not unbearable and there was plenty of shade for all of those who attended. 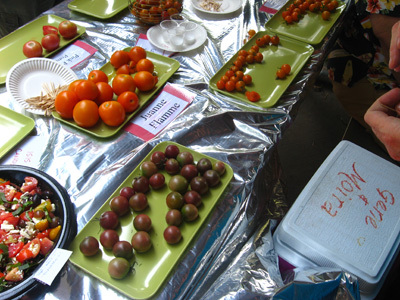 We had around 40 tomato tasters and I believe 69 different varieties to sample. Everyone had a great time sampling the tremendous variety of tomatoes, visiting with old friends, and making new friends who all had the common denominator of a love for the best tasting tomatoes in the universe! A big thank-you to all of those who helped with the set-up and take down of the tables and cleanup of the trash. It’s so nice when people pitch in and help to get the job done! Next year I’m going to look into changing the venue to an indoor one with air conditioning. I think a lot of people stayed home to avoid the heat and a cooler venue might bring up attendance. If anyone has connections with a local church that has a small banquet area we could use for next summer, I’d appreciate any leads. I’ll be more than willing to fill their church garden with plants next spring in exchange for the use of their facilities for a few hours. 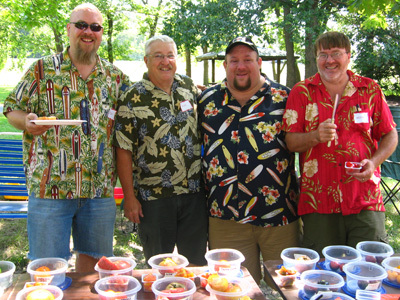 Rod has posted a great blog about the tasting already…go check out his site http://midwestrocklobster.blogspot.com/ and comment on his excellent gardening and cooking skills. I can see Rod as the host of a Food Network show at some point in his future! While you’re at it, go to TomatoTown and see their take on the event and some amazing photography to boot! I’ll do my best to list the varieties we had. I’m not going to be able to list all of Keith’s varieties he brought, but hopefully he’ll send me a list and I’ll add it to the blog when I have more information. I’m not sure if it was the taste or the shocking deliciousness of eating a green when ripe tomato for the first time, but Aunt Ruby’s German Green was raved about by almost all who tasted it. There were a lot of raves for Brandywine Sudduth’s, Stupice, Carbon, Cherokee Purple, and Cherokee White. The only one that proved to be not as good wire Roma VF which is primarily used as a sauce tomato and rarely eaten raw and by itself. My personal favorite was Henry..a variety Keith brought along to taste. Again…please upload pictures of the event to the KCTTTT 2 group at Flickr for all to enjoy! Here are a few pics I stole from Rod’s blog until we get our pics uploaded. Oh yeah…congrats to Rod for having the heaviest tomato…a monster Carbon! I am so disappointed. I missed the festival, not because I didn’t plan to go, and not because of the weather or even because I didn’t show up at Roe Park on Saturday. I didn’t catch the time of the festival and got there at 9AM. There were no signs, no banners, no markleting materials of any kind indicating that something was happening in the park that day. I would expect to see a banner priominently displayed, but neither my friend nor I could see any indication of a tomato-tasting festival that was set to start an hour later. We were there at 8:30 and most of it was set up by 9:00. There are only two shelters and they are side-by-side and one of them had tables covered in silver film and was covered with plates of tomatoes by 9:00. I don’t put up a lot of signage because I want to avoid having the hundreds of people using the park for other events to stop by for a free lunch. I’m sorry you missed us…it was a great time!